Pictured above are the founding fathers of Madison County Fish and Game. 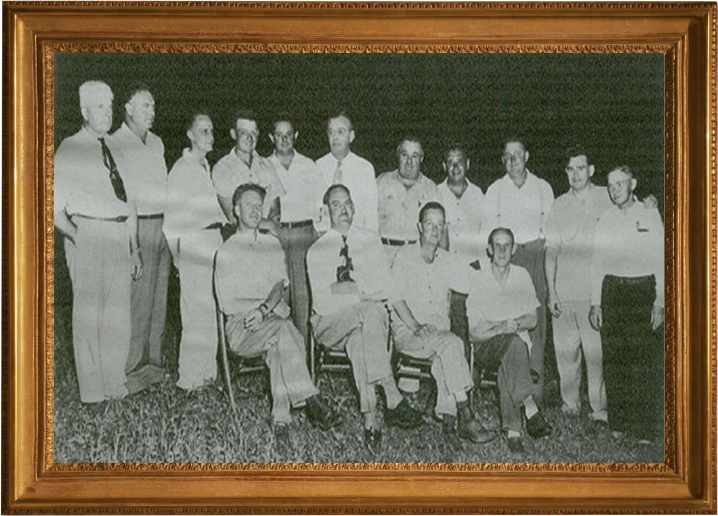 These men helped start Madison County Fish and Game back in 1945. Standing left to right: R.O. Whitacker, P.O. Harbage, Horace Hume, Paul Sanford, Floyd Hilman, Robert Tanner, Ned Speasmaker, Tom Wood, Urlick “Butch” Baurle, Gus Catonzaro, Kenny “Pappy” Johnson. Seated in chairs left to right: Marcus Cornwell, Robert Conner, Dean Reese, Eddie Shaw. Picture was originally taken July 13, 1948, at Tom Wood’s cottage, Madison Lake. R. O. Whitacker: had the car lot on the corner of Old Springfield Road and North Main Street across from the hospital. Horace Hume: had a hardware store in the Murray Building on East High Street. Robert Tanner: farmed on Springvalley Road. Gus Catanzaro: owned the London Fruit Market on East High Street. Kenny “Pappy” Johnson: was a deputy sheriff. He also had a store on West High Street where PNC bank is now. He also sold bait and tackle at Madison Lake at Tom Wood’s cabin. Marcus Cornwell: ran a loan company on South Main Street next to Starr Trophy. Eddie Shaw: had a plumbing and heating business. He bought it from Jack Raub’s dad and passed it to his son. Ned Speasmaker and Urlich Bauerle were neighboring farmers. Their farms butted up to the lake. P. O. Harbage: was a farmer from West Jefferson.